Douglas Laing was established in 1948 by Fred Douglas Laing. They are a 3rd generation, family-run Scotch independent bottler who specialise in artisan, small batch and single cask bottlings. They try to keep their customer experience as close as possible to a distillery experience and release with no added colour and no chill filtration. 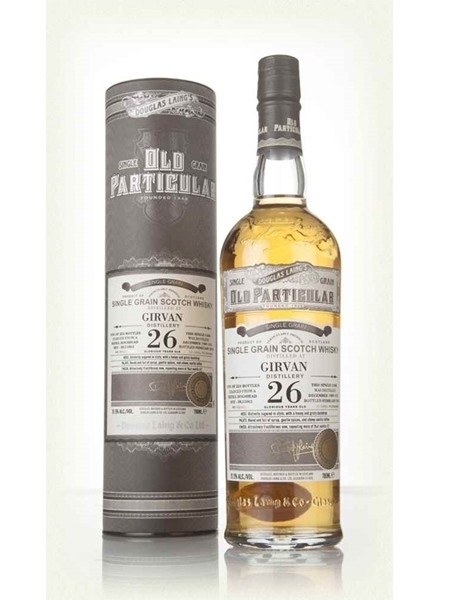 Girvan distillery is located on the west coast of the Scottish Lowlands. It was built in 1963 by William Grant & Sons, exclusively for grain whisky production to go into their blends. Douglas Laing identified this exceptional 26 year old cask of single grain to form part of their Old Particular range. This is one of only 224 bottles and is bottled at 51.5% ABV.